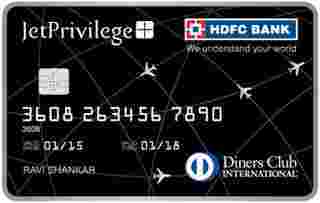 JetPrivilege HDFC Bank Diners Club is typically available to those with good credit scores (650 or greater). - On purchases within the first 90 days. - In addition, earn 15,000 miles and 15 Tier points on the first swipe of your card, within the first 90 days. - Get 10,000 Miles, 5 Tier points, and complimentary Base fare waived ticket & discount voucher for return flight ticket on the first swipe within 90 days of card renewal. - 1% fuel surcharge on every transaction of Rs. 400 - Rs. 5,000 (A maximum surcharge waiver of Rs. 250 per statement cycle). You need to pay a high annual fee for this card in order to avail the benefits. Although the annual fee is high, the card charges the lowest interest rate out of all travel credit cards. You can earn as much as 24 JP Miles for every Rs. 150 spent on Jet Airways tickets. You can use these miles for buying tickets, upgrading your flight, and much more. All in all, this is a premier travel card with exclusive privileges.